Filleting knives are special knives that are used to slice the meat clean off the bone of a fish. They come in various sizes to account for different sizes of fish. You also have the option of picking from a manual knife or one that is electric. 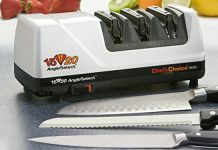 Electric knives get the job done faster and do not require as much skill as the manual ones. However, they are also known for sloppy cuts which could be wasteful. 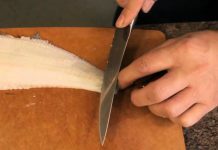 You will, therefore, need to practice over and over again to gain the precision and learn the proper amount of pressure to put on the fish as you use the electric knife. 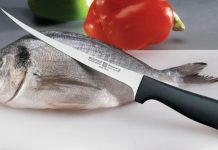 To get the best salmon filleting knife, you have to know the needs you have to consider as you use the filleting knife. First of all, salmon is one of the bigger fish. It will need a larger blade if you are to have a good filleting experience. Any blade that is above seven inches can work well. You always want to ensure that you slice through your salmon however thin or thick you want your pieces to be without having to waste any of the meat. After all, salmon is not cheap. You do not want to expend your energy to catch the best only to waste a significant amount of the meat. Another thing that you will need to consider is the handle of the knife. You want to use an ergonomic handle that easily rests on your arm even when you are working on a wet surface. You do not want a knife that places too much tension on the wrist, neither do you want to slip and cut your finger because there is no finger stop on the knife. Additionally, you want to be able to use a knife comfortably whether you are left or right handed. 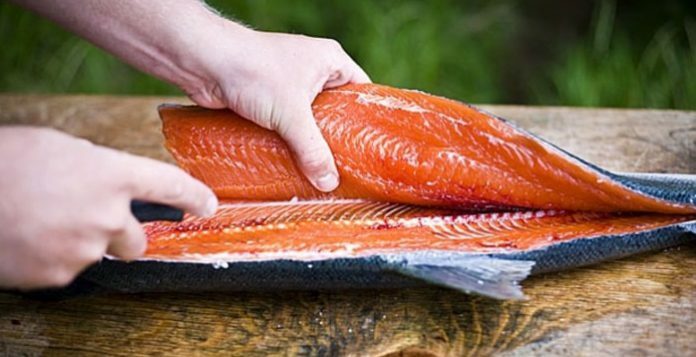 These might seem like minimal factors but they will play a crucial role once you need to fillet your salmon, especially if you have a lot of fish to work on. This bonded teak fillet knife is great for salmon. The seven-inch blade has been forged from stainless steel which is highly resistant to corrosion and rust. The blade is seven inches, which is perfect for salmon which is a bigger fish. This knife has a curved blade set on a wood handle. It slices through salmon effortlessly and is easy to handle because of the ergonomic handle. These qualities place the Schmidt Bonded Teak knife ahead of the pack as a popular salmon filleting knife in both professional and domestic kitchens. If you purchase the knife set you get a very attractive wood block where you can store the knives. However, some customers have noted that this block is quite high which means that it will not fit in all cabinets. This knife boasts of seven inches of the blade which makes it great for filleting salmon. It is forged from high carbon stainless steel which is durable and highly resistant to corrosion and rust. The knife keeps a sharp edge for long periods of time even after using it severally. The handle is ergonomic and triple riveted for easy handling and to ensure that the blade is strongly held in place. The Wusthof Classic knife comes with a classic sheath that helps to protect the blade. It also has aesthetic appeal. This knife has received positive reviews from customers who have used it to fillet salmon as well as other medium and bigger fish. There are no complaints about it except that you have to shape the sheath in the shape of the knife so that you do not end up poking a hole in it. This is one of the larger blades as it measures nine inches, which is more than enough to cater for the size of salmon. It helps to cut and trim salmon easily without any meat sticking to the knife. It is flexible, offering easier handling to avid fishermen who are always cleaning some salmon. It is suitable for both domestic and professional use especially because of the tang construction which makes the blade strong and stable. The handle is made from a thermoplastic polymer which is easy to grip and prevents slips even when the working surface is wet. Most customer reviews are positive. However, some customers have noted that the knife gets dull fast and you have to keep sharpening it whenever you need to use it again. The Marttini fillet knife is one that works great when filleting salmon. The seven and a half inch knife is more than sufficient for salmon. The blade is crafted from high-quality stainless steel which resists rust and corrosion even with direct continued interaction with water. It comes with a leather sheath for storage which comes in handy for traveling fishermen who need to protect their filleting knives and maintain their safety as well. The waxed rosewood handle is ergonomic, allowing for flexible and easy handling as you fillet your salmon fish. There are no negative reviews on this salmon filleting knife. One of the best features about this knife that makes it best for filleting salmon is the nine-inch blade. The full tang Swedish stainless steel blade is strong enough to handle any tough meat. It also has a reinforced varnished handle which makes it easy to carry out your filleting. Additionally, it comes with a sheath to protect the blade when it is not in use. There are many positive customer reviews about the knife, praising its sharpness and how it holds a sharp edge for a long period of time. The only slightly negative customer review notes that the knife blade can bend slightly which makes it less efficient. This is one of the more famous filleting knives. The manufacturer has been in business since the 1800s which means that the knives provided have always been durable and have grown better with time. This fillet knife is slim and has a very flexible blade which is a good quality when you are filleting salmon. 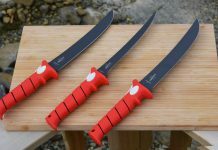 The knife is easy to clean and has an eight-inch blade which provides enough coverage for salmon which is a bigger fish. It has an ergonomic white handle which is classy and chic. It also has a finger stop that allows you to have a good grip on the handle even when working with a slippery or a wet surface. It is one of the cheaper filleting knives that still provide value for money. Most customers that have bought the knife are pleased with it although some have noted that the knife rusts easily. This knife has a seven-inch blade that is made from high carbon stainless steel. One of the unique features about the blade is that it is ice hardened to provide for superior strength. The polypropylene handle is ergonomic and easy to handle for people with big and small hands alike. Most customers have glowing reviews when it comes to this salmon filleting knife. However, one customer pointed out that the blade broke in half after it fell on the floor, something that is standard in most kitchens. However, the manufacturer did replace the knife. This knife is one of the most sought after electric knives for fishermen. It comes with a number of blades, one which measures eight inches and is, therefore, suitable for use on salmon. This electric knife has the higher torque to ensure that you get smoother and more consistent filleting for your salmon. The eight-inch blade has a curved tip which comes in handy when you want to slice the meat clean off the bone. On the other hand, the American angler also has a ten-inch knife which is not only big enough to work on a salmon but also saltwater resistant. You will have to learn the right amount of pressure to use on the knife to stop any meat wastage. However, this knife is well loved by customers in general. One of the complaints that customers have made concerning the knife is that the motor runs hot quite fast which forces you to switch it off so it can cool down. This greatly affects the salmon filleting process. This knife is one of the cheaper options you can get for filleting your knife. The seven inch blade is crafted from high quality German stainless steel which is ground to a beveled edge that is 24 degrees. It is well coated to protect the blade from rust and any corrosion, making it a very durable blade. It has a handle that is made from soft rubber polymer making it easy to grip and handle. Additionally, this handle is ergonomic and heavily contoured to enhance flexibility during salmon filleting. One of the limitations associated with the knife is that it does not hold a sharp edge for long. Customers have noted that they had to sharpen the knife multiple times to get it is filleting condition. This knife has a blade that is crafted from titanium with tungsten carbide. It has a convex edge that is well ground, providing for sharp and precise meat cutting as well as desired flexibility. The blade is seven inches which is more than enough for use on salmon. The knife also has a polymer handle that is oval shape which provides for easier grip and handling. One of the shortcomings associated with this knife is that it is quite pricy even though it provides value for money. 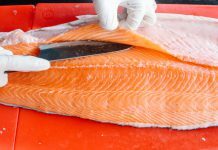 At the end of the day, before you settle on any fillet knife for your salmon, you will need to consider the blade type and the handle. 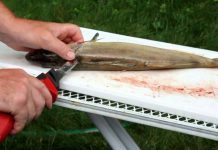 These two aspects of the blade are crucial to the filleting process. The above knives all have quality blades and handles. Additionally, it would be best to get a knife that comes with a warranty. If anything happens to come off or break, you can always get a replacement and you will not have wasted your money. The same cannot be said of manufacturers who do not offer the same services. It is imperative that you pick the best knife for the job because you will want to slice your salmon clean off the bone without having to waste any of this precious meat. Best Japanese Fillet Knife – Fillet Like a Pro!